Northwest Biofuels Association Holds Community College Biodiesel Training for Diesel Mechanics in the Northwest. Teachers will find many useful links and information on the Education Resources page and on the Grants page. 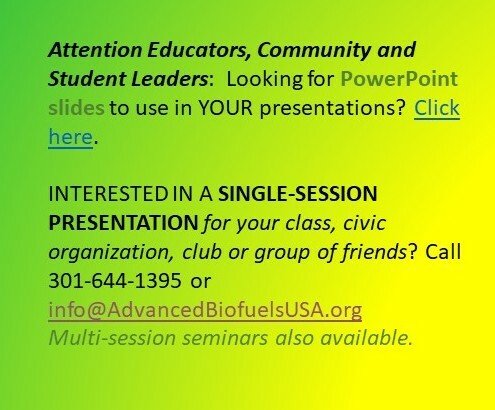 In addition, Advanced Biofuels USA has prepared PowerPoint presentations available in the Biofuels Basics section on the PowerPoint Presentations page. This page provides links and information about a sample of programs and activities in schools; stories about teachers and students who “learned by doing;” and news reports about educational activities. For more examples, click on categories such as Education and Teacher Resources along the right margin of the web site. Advanced Biofuels USA is gathering contact information for educators around the world who are working on curriculum-based educational materials to teach about advanced biofuels. If you or someone you know is working on such materials–or wants to, please provide us with contact information and the reason you/they want to be a part of this network. Let us know what sorts of materials or services this collaborative network might provide that would be useful for developing quality, effective, up-to-date educational materials. 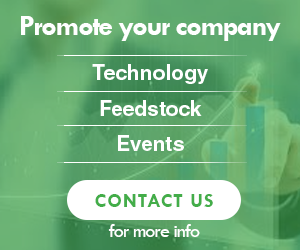 Email us at info@advancedbiofuelsUSA and put Educational Network in the subject line. As part of the world’s premier museum and research complex, the NSRC can provide special access for teachers to the scientists, curators, and educators at the Institution. Most Smithsonian Science Education Academies for Teachers sessions will be held at the museums and research centers of the Smithsonian and other museums and laboratories in or near Washington, D.C.
*One additional person—spouse, friend, child—may stay in the participant’s room at a small additional cost. EnvironMentors Program which prepares underserved high school students for college degress and careers in environmental and related sciences through one-to-one mentoring. It includes 10 university-based chapters across the United States. University Affiliate Program works to strengthen academic environmental programs at over 150 member colleges and universities nationwide, and presents a unified voice in promoting federal funding for environmental research and education. Council of Environmental Deans and Directors (CEDD) brings together academic leaders to improve the quality and effectiveness of interdisciplinary environmental programs across the nation’s campuses. Council of Energy Research and Education Leaders (CEREL) fosters interdisciplinary collaboration among academic energy leaders and advances education, research and communication to ensure a sustainable energy future. Campus to Careers (C2C) Program supports young professionals in the transition to environmental careers through paid internships and fellowships with government agencies, buisnesses and non-profit organizations. The University of Idaho’s Biodiesel Education Program has released curriculum designed to help students between the ages of eight and 12 understand the concepts of energy and renewable energy. While the free seven-lesson program was written for 4-H clubs, the Biodiesel Education Program stresses it is also appropriate for use by elementary school teachers. The curriculum features several hand-on activities, including a matching game, a fossil fuels timeline and a renewable energy model. Other components of the program include an energy tour and viscosity wands. Increase awareness and knowledge of biodiesel in the classroom and community. Encourage teaching, production, and use of biodiesel through a multi disciplinary approach. Increase awareness and knowledge of pollution prevention and resource conservation principles through biodiesel curriculum. Encourage participation in partner programs through the teaching and use of biodiesel in schools. AHB provides informative activities for elementary, middle, and high school students to learn how bioenergy and bioproducts can play an important part in their world. Chemistry, engineering, and biology are brought together to develop student’s understanding of sustainable energy options and spur their interest in renewable energy careers. Students will explore how to grow poplar for bioenergy, measure carbon storage, compare different biofuels to fossil fuels, and measure their carbon footprints. These activities use Next Generation Science Standards. The activities range in time from 30 to 50 minutes. Some of them will require more than one class period. Part 2: Understanding Biomass: Plant Cell Walls. Quantitative Modeling of Biofuels Life Cycles. If you have used our LCA of Biofuels 101, this is a natural extension for the high school and undergraduate level. The activity allows students to compare the net energy life cycle of ethanol production for switchgrass, diverse prairie and corn stover, under different conditions. Using Microsoft Excel spreadsheets, students model a range of scenarios, starting with data and assumptions provided in the package. This is a flexible model with many opportunities for modifications depending on the abilities and interests of the students. Root Depth Model. In this activity, raffia ribbon is used to create a visual representation of the differing root depths in biofuel crops and prairie plants. The wall hanging can be used to promote discussion about plants’ ability to sequester carbon and contribute to soil carbon. Bioenergy Institute for Educators For eight days, 12 teachers ranging from elementary to high school work directly with GLBRC researchers and learn more about biofuels. The goal of the program is to engage teachers with new tools and hands on participation. Human energy use and biofuels and their role in managing global climate change are urgent current socio-scientific issues facing our society. The Next Generation Science Standards recommend that students learn about these about issues. However, the story is complex and students will need multiple opportunities to work through it. The materials provided here provide a way to launch a study of biofuels. We recommend that you tell the story of biofuels and post a story wall in your classroom. The included online Prezi presentation version can serve as an introduction and review of the story. Students remember stories because they are coherent and connected to a plot line. The story wall can act as a reference for students as they work through multiple activities (See teacher guide for details). The story wall can act as a focal point for discussions and elaborations as students’ knowledge grows. The Biofuels vs Fossil Fuels unit has students explore the similarities and differences between fossil fuels and biofuels. In the process, students investigate the carbon-transforming processes of combustion, photosynthesis, fermentation, respiration, and the overall effect of these fuels on the global carbon cycle. This in-depth unit was written in collaboration with education researchers a Michigan State University and aligns with the Next Generation Science Standards. They apply their knowledge of these processes to the global carbon cycle to examine how use of fossil fuels and biofuels have different effects on atmospheric carbon dioxide levels and consequently global climate change. Students use their understanding of the global carbon cycle to study the claim that biofuels, such as ethanol made from plant material, can help reduce the rate of increase of atmospheric carbon dioxide. In addition, students examine the environmental impact of biofuels agriculture. Matter and energy changes associated with the carbon-transforming processes. The effects of the use of fossil fuels and biofuels on the global carbon cycle and global climate change. A cost/benefit analysis of the production and use of biofuels. A new curriculum has been created to strengthen our 4-H STEM effort. This new web-based resource will help our next generation of leaders develop an awareness and appreciation for a sustainable energy future. It is leader-directed curriculum, targeting 4-H Cloverbuds (K-2) and youth through 5th grade. It was created through Ohio’s 4-H Youth Development program and the Ohio BioProducts Innovation Center (OBIC). The material consists of three bioenergy curriculum pieces in the content areas of 1) bioenergy sources, 2) bioenergy conversion, and 3) bioproducts. Each curriculum piece contains about nine educational activities. Ohio State University Extension’s 4-H Cloverbud program is designed to meet the developmentally appropriate needs of children ages 5 to 8, or in kindergarten through the second grade. However, this curriculum is recommended for youth through fifth grade. The Cloverbud youth development program emphasizes overall well-being by empowering young children with successful learning and positive social interaction through cooperative learning in non-competitive environments. The curriculum was developed with support from the Northeast Regional Sun Grant Initiative, with a grant from the U.S. Department of Transportation: US DOT Assistance #DTOS59-07-G-00052. Also, the STEM pathway challenges. The challenge curriculum and a 4 to 6 minute informational video will prepare facilitators and engage youth through experiential learning. The “Corny Polymer Balls” and “Natural Glue” activities are specifically related to bioproducts. The “Glucose Detective” activity could be adapted to use as a biofuel activity where youth test the sugar content of food products for use in biofuels rather than applying it towards diabetes. Creative Discovery Museum’s Farming for Fuels program is a series of classroom education lessons presented through the Museum’s school outreach program, Museum-A-Go-Go. The program provides lessons by Museum outreach staff for Grades 4-7 on the scientific processes for creating biofuels from switchgrass rather than from corn. The Biofuels Mobile Learning Center (BMLC) is an interactive traveling exhibit designed to explain and promote the use of ethanol and biodiesel. Featuring educational displays, fun interactive touch screens, videos and more, the exhibit is designed to appeal to all ages. The BMLC is offered for use at no cost courtesy of Indiana corn and soybean farmers. Our goal in creating these modules was to offer a one stop shop for agricultural energy modules that instructors can use in their classrooms. 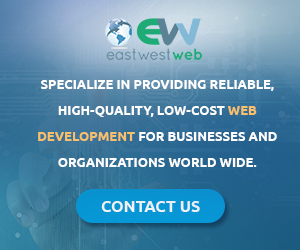 In doing so, we did the heavy lifting of sifting through mounds of websites, research, and cutting edge technologies to bring you the information in an easy to understand format. We made sure to create non-biased material that puts students in a position to make a decision about the agricultural energy that interests them most, or is most cost effective for their own farms. We made sure to use PowerPoint so instructors could make changes to the presentations or re-brand them in a way they see fit. The resources are split into two lessons. In the first lesson, students will begin by learning about the different types of biofuels that are being produced as alternative renewable sources of energy. 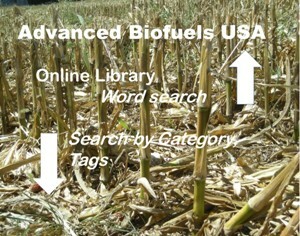 They will explore the advantages and disadvantages of these different types of biofuels, and begin to make comparisons. The second lesson includes a role-play exercise to aid further exploration of the impacts of biofuels production in countries such as Brazil, Malaysia and the USA. The resources have been created and trialled as a cross-curricular exercise for whole classes or larger student groups at Key Stage 3 and above. The resources were developed and trialled by Michelle Albury, Jennet Wade and Rebecca Ward, teachers at Graveney School in South London. ESF in the High School is a school-college partnership program that enables qualified high school students to experience college-level course work and to understand the complex scientific and social perspectives behind news headlines. The Environmental Summit is a research symposium designed to bring together a community of high school aged scientists to present and discuss their original research to their peers, college science faculty, graduate and undergraduate students. The goals of National Science Foundation GK12 project are to enrich high school student science learning and engagement and to enhance teacher and graduate student professional development. The Science Corps supports campus-based, in-school, workplace and field-based science, technology, engineering and mathematics (STEM) learning and professional development experiences for middle and high school students and teachers. ESF SCIENCE summer programs expose Syracuse middle school students to science and environmental education. Participants are involved in camps that emphasize urban ecology and urban ecosystems. The Environmental Challenge is a science fair and career exploration opportunity designed especially for all Syracuse City School District seventh and eighth grade students. Other programs include the Introduction Green Entrepreneurship course, the Environmental Summer Institute for Teachers, and the Sustainability and Green Entrepreneurship project. Be sure to check out the Willow Biomass Energy education modules. The Sun Grant BioWeb, an online resource that makes information available about bioenergy and other plant-based products from biomass, is reaching out to K-12 teachers who will teach the next generation of consumers and scientists. Plans for the coming year for the Sun Grant BioWeb include adding a clearinghouse page about K-12 curricula available for teachers. Teachers and others interested in the science of the emerging biobased economy can find the Sun Grant BioWeb online at http://bioweb.sungrant.org. The concept of the Sun Grant BioWeb developed as one way to provide information for scientific researchers, policy makers, large- and small-scale industry, agricultural producers, and others who want to learn more about biomass research. They are provided inline with our strategic priorities which include bioenergy and industrial biotechnology. Who should download these activities? Researchers – To communicate and engage young people with the scientific principles and research in the fields of bioenergy and biofuels through practical activities. Teachers – Many of the activities are suggested by exam boards to cover the knowledge, understanding or practical skills content required for GCSE, A-level or Higher examinations. What is in the practical guide? Please note many of these resources are very large file sizes. If you have any problems please let us know at:webmaster@bbsrc.ac.uk. Each unit provides five, comprehensive, standards-based lesson plans and supporting resources. The middle school unit and eLearning experience are special projects of the American Farm Bureau Foundation for Agriculture, made possible by the generous support of Tri State Generation and Transmission Association. The high school unit is a special project of the California Foundation for Agriculture in the Classroom. The high-school unit introduces energy flow and challenges students to identify energy inputs for agricultural products. Students evaluate renewable energy sources, conduct a biodiesel lab and research farms using renewable energy. This unit was funded by the United States Department of Agriculture’s National Institute of Food and Agriculture to foster an appreciation for agriculture, reinforce STEM skills and abilities, and create an awareness of agriculture-related careers. For more information about the California Foundation for Agriculture in the Classroom, visit www.LearnAboutAg.org. A critical component of the Science from Scientists philosophy is the need to send real, charismatic scientists into the classroom, during school every-other-week for the entire school year. SfS has always been a during school program because we believe that every child should have the opportunity to be exposed to STEM, not just those in after school programs who are already interested, or whose parents sign them up. GK-12 Bioenergy Sustainability Project – 22 schools in SW Michigan are installing schoolyard bioenergy research plots. For more examples of school-based projects click on the Teacher Resources category.